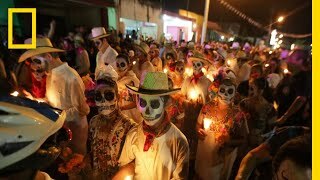 This opening scene to the movie, Spectre, takes place in a parade celebrating the Mexican holiday, Día de los Muertos. Many of the residents are celebrating by dancing, eating traditional foods, and wearing the skeleton face mask, a signature of the holiday. How are people dressed on Day of the Dead? Describe the atmosphere of the festival.